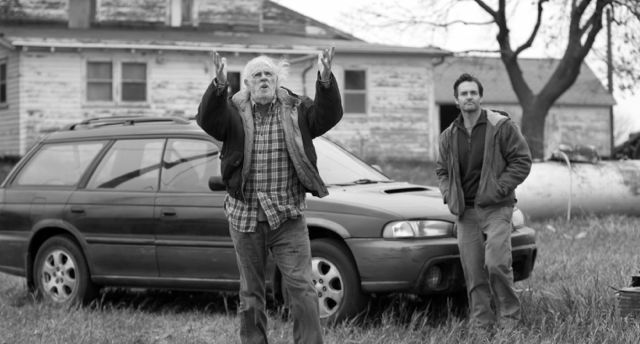 Alexander Payne’s “Nebraska” is as rich and engaging as its monochrome images of the American northwest are crisp and daunting. A road picture about dashed aspirations and misguided dreams with some kind of redemption, it’s like a walk in brisk winter that ends at the warmest of hearths. Bruce Dern plays an intemperate, boozy old man named Woody who decides that he’s owed $1 million by the Nebraska magazine firm that mailed him a sweepstakes subscription come-on and he elects to head from his home in Montana to collect it. Banned from driving and unable to persuade his intimidating wife Kate (June Squibb) to make the 850-mile journey, he heads off more than once on foot only to be thwarted by his patient but exasperated younger son David (Will Forte). David has his own demons, however, and he decides suddenly that he will drive his doggedly determined and annoyingly laconic father to Nebraska to learn the truth that there is no sweepstakes win. The road trip leads them through the small windswept town where Woody grew up and they encounter estranged family members and friends most of whom choose to believe that the old boy is about to become rich and they’ll happily take a share of it. Writer Bob Nelson’s observant script, Phedon Papamichael’s shimmering black-and-white cinematography, Dennis Washington’s evocative production design, and Mark Orton’s lovely guitar-led score aid director Payne as he crafts a tale that is unsentimental but moving and often very funny. The acting is equally sublime and there will be awards nominations. Veteran screen villain Dern shows the assured acting skill of the complete professional. He suggests that Woody’s taciturn nature and stubbornness could mean incipient dementia or be the result of too many disappointments and too much booze or possibly because he just chooses to be that way. Forte is a revelation as he shows how David grows as a man the more he learns about his father’s past and Squibb gives an unforgettable performance as a woman who might nag her husband but will not allow him to be disrespected by anyone else and will not tolerate fools or liars. Kate and David’s older brother Ross (Bob Odendirk) join the trek to Nebraska and the shaky fabric of family bonds through encounters with hapless thieving nephews, a conniving former business partner, and a long-ago lover. Payne uses non-professionals to play some of the old-timers and their stoic quietude matches the bleakness of their surroundings. The director, whose credits include “The Descendants” and “Sideways”, knows this territory and he shows that while the landscape might be bitter and life hard, it remains possible to love one another and dream a little bit. Opens: UK Dec. 6 (Paramount Pictures); Cast: Bruce Dern, Will Forte, Stacy Keach, June Squibb, Bob Odenkirk, Mary Louise Wilson, Rance Howard, Tim Driscoll, Devin Ratray, Angela McEwan; Director: Alexander Payne; Screenwriter: Bob Nelson; Director of photography: Phedon Papamichael; Production designer: Dennis Washington; Music: Mark Orton; Costume designer: Wendy Chuck; Editor: Kevin Tent; Producers: Albert Berger, Ron Yerxa; Executive producers: Doug Mankoff, Neil Tabatznik, George Parra, Julie M. Thompson. UK rating: 15, running time 114 minutes. 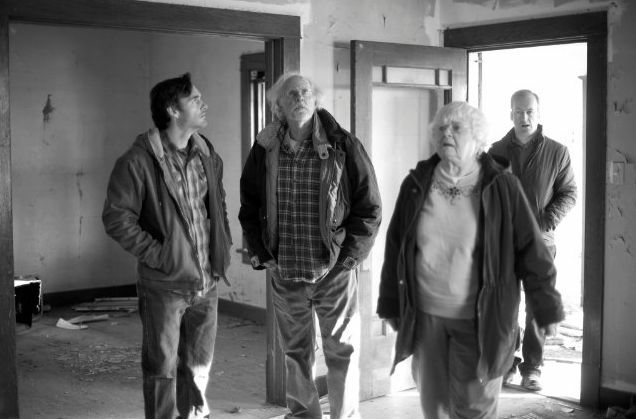 This entry was posted in Film, Reviews and tagged 'Nebraska', Alexander Payne, Bruce Dern, June Squibb, Paramount Pictures, Stacy Keach, Will Forte. Bookmark the permalink.